Never fill your pressure cooker more than half full with food or two-thirds full of liquid. People are in such a hurry these days. Everyone wants to save time, and cooking is one area where most people want to save lots of time. Cooking innovations such as microwave ovens, convection ovens, Advantium ovens and, in a way, slow cookers, have been created in an effort to satisfy the demands of our "hurry up" society. However, there’s been a solution to the problem of preparing food quickly -- and doing it very well -- for generations. The pressure cooker. The Presto brand pressure cooker first caught the attention of housewives in 1939 at the World Trade Fair in New York, and Presto has been making them ever since. From the variety of pressure cooker brands and models now available, these appliances are quite popular. Although many people associate them only with canning, pressure cookers are a great way to get a good meal on the table in a minimum amount of time. And with proper usage and care, they are quite safe. Do you own a pressure cooker? Is it a newer model with loads of features, or the older rocker-valve kind like mine? Whichever one you have, or if you’re thinking of buying one, there are lots of advantages to cooking with a pressure cooker. I thought my rocker-valve cooker was the only type available, but found that there are two other types: the developed-weight valve and the spring-valve pressure regulator. You’ll know the rocker-valve type by the round metal valve with a hard plastic knob that sits on top of the vent pipe in the center of the cover. As the pressure rises, the valve rocks back and forth. The developed-weight cooker’s vent pipe is usually located on the cover handle. The spring-valve kind has a dial that allows you to choose the level of pressure you need, which comes in handy depending on what type of food you’re cooking. Just how do pressure cookers work their magic? They use built-up steam that creates pressure and high heat. The food cooks at a higher temperature, so the cooking time is cut way down. Think how convenient that can be when you’re running late and need to fix something quickly. Because it saves you time, you can make more meals (and more healthful meals) at home. There are a few cautions you need to keep in mind. Never fill your pressure cooker more than half full with food or two-thirds full of liquid, because the contents increase in volume under pressure. Also, be sure you use at least 1 cup of liquid (usually water) so that the pressure can build up and your food won’t burn. Some cookers call for at least 2 cups, so check your owner’s manual. There are several ways to release pressure, and you’ll need to use two of them in these recipes. Natural release is easy; when cooking time is done, just remove the cooker from the heat and let the pressure drop by itself. For quick-release (depending on what kind of cooker you use, so check your owner’s manual), remove the cooker from the burner and place it in the sink. Run cold water over the top of the cover until the pressure has been released. Soak beans overnight in enough water to cover. Drain. In a pressure cooker, cover beans with at least 1 inch of water. Add 1 clove garlic, half the onion, and 1 tablespoon vegetable oil. Lock the lid in place and bring cooker up to full pressure over high heat. Reduce heat to medium-low to maintain even pressure, and cook for 10 minutes. Remove from heat and release pressure quickly. The beans should be very soft. If not, lock the lid in place and return to full pressure. Cook for 2 to 3 minutes longer. Remove from heat and release pressure quickly. Drain beans, reserving cooking liquid. In a food processor, purée bean mixture, adding some of the reserved liquid as necessary to make a smooth consistency. Mince remaining onion and garlic. In a large pot, heat the remaining 2 tablespoons of oil over medium heat. Add the onion and garlic and sauté for about 5 minutes or until onion is transparent. Add puréed bean mixture to the pot, along with enough of the reserved liquid to make a smooth soup. Bring to a boil and simmer for 10 minutes. Season with salt and pepper. Add cream and simmer until thickened and smooth. Serve individual bowls of soup topped with a handful of grated cheese, a few cubes of avocado, and a sprig of cilantro. Makes 4 to 6 servings. 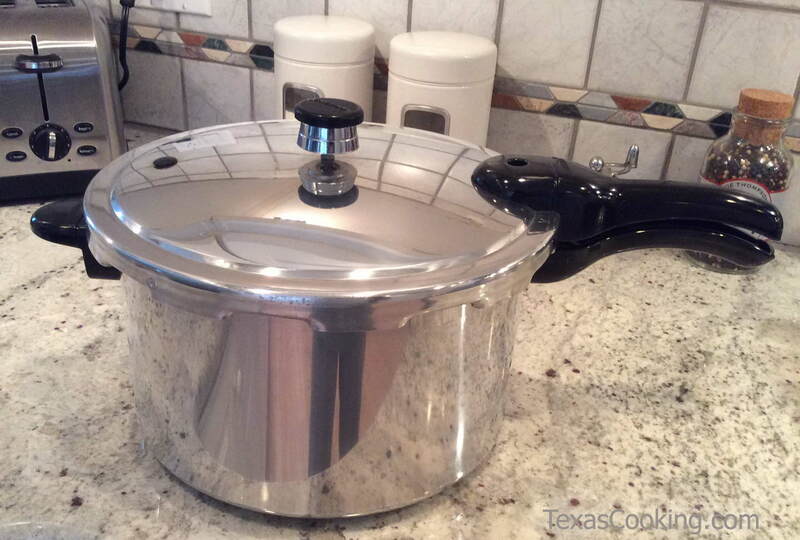 Pressure cookers come in many sizes from small to large (and really large for canning). If you find that your brisket won’t fit well in the bottom of your cooker, it’s perfectly fine to cut it into two pieces, as long as the entire mixture doesn’t fill the cooker more than two-thirds full. In a small bowl, mash together the sugar, cumin, chipotle chilies, 1 tablespoon of the olive oil, and tomato paste to make a smooth paste. In a zippered plastic bag or shallow dish, coat brisket with paste. Seal or cover and let stand at room temperature for 1 hour or refrigerate overnight. In the pressure cooker, heat the remaining oil over medium-low heat. Add the onion and cook for about 10 minutes, stirring occasionally, or until golden. Add the garlic and cook 2 minutes longer. Stir in the tomatoes, Worcestershire, salt and pepper and simmer, uncovered, for 5 minutes. Place the marinated brisket in the pressure cooker and drizzle with the remaining marinade. Lock the pressure cooker lid in place and bring it up to full pressure over high heat. Reduce the heat to medium-low to maintain even pressure, and cook for 1 hour. Remove from heat and allow pressure to drop naturally (about 10 minutes), then release any remaining pressure quickly by running cold water over the lid.. Transfer brisket to a warmed platter and tent with foil to keep warm. Bring sauce to a boil. Reduce heat and simmer for about 10 minutes or until sauce is reduced and thickened. Slice brisket thinly against the grain (or shred) and serve with the sauce. Makes 6 to 8 servings. Did you know that you can make desserts using a pressure cooker? My mom used our rocker-valve cooker to make only main dishes. It never crossed my mind that pressure cookers can make desserts. Now, looking through old instruction manuals (one from the late 60s, the other from the late 70s), I’ve found a few dessert recipes, but nowhere near the variety that you have with the newer cookers. Progress! For this flan recipe (did you ever think you’d be making flan in a pressure cooker? ), you’ll need a 5-cup baking dish. Make sure the dish fits comfortably in your cooker, and that you’ll be able to lower it in and remove it easily (the how-to is in the recipe). It needs to be refrigerated overnight, so allow yourself enough time to prepare it before you plan to serve the flan. Heat the sugar in a small skillet over medium heat until it melts and becomes a golden brown syrup. Immediately pour into a 5-cup baking dish that will fit in the pressure cooker, tilting the dish so that the sugar coats the entire bottom. Work quickly because the syrup will harden. Combine the milk, condensed milk, vanilla, and salt in a bowl. Add the eggs and whisk until smooth. Pour into the prepared dish. Cover tightly with aluminum foil. Place a metal trivet or rack in the bottom of the pressure cooker. Pour in the water. Fold a 24-inch length of foil in half lengthwise. Center the baking dish on the foil sling and carefully lower it into the pressure cooker. Fold the ends of the sling down on top of the dish. Lock the cooker lid in place and bring to high pressure over high heat. Lower the heat to stabilize the pressure. Cook for 10 minutes. Remove from the heat. Release the pressure using the natural release method (takes about 15 to 20 minutes – consult your instruction book, if necessary). When pressure is fully released, unlock and remove the cover. Remove the flan by pulling up on the ends of the foil sling. Remove and discard all foil. Cool to room temperature before refrigerating overnight. To serve, cut around the edge of the dish with a sharp knife. Place a shallow bowl or plate on top of the dish and invert the dish. Cut the flan into wedges.